Troy Runge is an Assistant Professor in the Biological Systems Engineering in CALS where he performs research and teaches in the bioenergy field. Troy is a lignocellulose chemist by training and has Pulp and Paper Science degrees including a B.S. from UW-Stevens Point and M.S. and Ph.D. degrees from the Institute of Paper Science and Technology at the Georgia Institute of Technology. 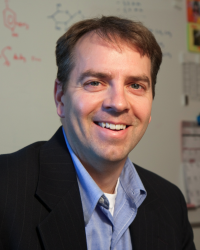 Troy spent several years at UW as the Director of the Wisconsin Bioenergy Initiative, and prior to that spent fifteen years working at Kimberly-Clark Corporation in a variety of research and engineering roles for pulp, tissue, nonwoven, and hygiene product production. Troy is currently working in several aspects of bioenergy and bio-based materials with an emphasis on biomass composition and separation technologies.